The Infinity WalkAbout is a figure-eight railing system that enables the practice of the Infinity Walk method with a guiding support rail. 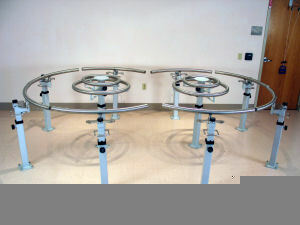 Its unique figure-eight design incorporates more functional uses than medical parallel bars. It is a clinically superior alternative to walkers for the practice of daily ambulation. It offers safe treatment practice of restorative methods used by physical therapists, occupational therapists, speech therapists and other health care professionals. "When staff at the Northeast Center for Special Care (a cutting-edge brain injury rehabilitation facility located in upstate New York) learned of the new Infinity WalkAbout, they immediately saw the possible benefits for the rehabilitation of individuals with traumatic brain injury." Learn more from their medical staff about their use of the Infinity WalkAbout. "This feels like walking along the boardwalk! You know, I haven't walked in years." The boardwalk is a lovely place to stroll that overlooks the ocean on the east coast of the US. This woman had been using a walker for years, but in contrast to using the Infinity WalkAbout, her walker use was not real walking. Infinity WalkAbout gave her a daily opportunity to pleasantly stroll and chat with near-by friends, just as she did on summer vacations in years past. The Infinity WalkAbout assists individuals who could benefit from physical handrail support and spatial guidance while ambulating along a figure-eight pathway. The uninterrupted pathway with full access to patient supports the rehabilitation process, from detailed finite skill development to gross motor endurance. The reciprocal walk pattern assists in functional practice of bilateral sensing; perceiving; rhythm, timing and pacing; attention; and the building of multi-tasking skill. Orthopedic limitations, movement discrepancies, performance blocks, and sensory-motor compensatory patterns can be isolated for intervention and retraining, refocusing treatment objectives, and functional progression. The Infinity WalkAbout also supports professional assessment of unilateral-bilateral gait; joint dysfunction and sensory-motor deficits”. Jane Ver Dow, M.S., P.T. Jane Ver Dow, P.T., is a senior physical therapist with 20 years of experience in physical and neuro-rehabilitation. She was the clinical supervisor for the first Infinity WalkAbout prototype trials in a nursing home. Clinical and home-use models are available. US Patent protection has been granted.